These conditions do not affect the rights entitlements and remedies conferred on a Purchaser who is a Consumer under the Consumer Guarantees Act 1993. ‘Consumer’ has the meaning given to it in the Consumer Guarantees Act 1993. ‘goods’ means the goods described on the front of this document, or where there is no such description those things provided by HVAC TOOLS to the Purchaser, including but without limiting the generality or the foregoing all raw materials and manufactured items. ‘HVAC TOOLS’ means HVAC TOOLS New Zealand. ‘Consumer Guarantees Act 1993’ means and includes the Consumer Guarantees Act 1993 and any Fair Trading or other consumer protection legislation and includes any statute amending, consolidating or replacing the same from time to time. (a) Any terms and conditions set out in any order or other documents submitted by or on behalf of the Purchaser shall be inapplicable unless any particular part of these terms and conditions or other modification or addition to these Conditions is expressly agreed to in writing by HVAC TOOLS. (c) Except as provided in these Conditions and except for those conditions and warranties implied by the Consumer Guarantees Act 1993 which may not be modified or excluded, the Purchaser agrees that it has not relied on any inducement, representation or statement made by or on behalf of HVAC TOOLS in purchasing the goods and that there are no implied conditions or warranties herein and no collateral contracts in existence. Subject to Condition 1, any advice, recommendation, information, assistance or service provided by HVAC TOOLS in relation to the application or use of the goods is given in good faith and is believed by HVAC TOOLS to be appropriate, but is given without any liability or responsibility on HVAC TOOLS part. Goods of HVAC TOOLS manufacture are based on current price of materials and cost of production. All prices other than those quoted firm shall be at time of delivery. Goods from other manufacturers or sources, unless sold ex-stock, are quoted in good faith, however variations in duties, freight costs, exchange rates or suppliers’ increases shall be the Purchaser’s responsibility. Quotations offered as firm are valid for thirty days from date of offer unless otherwise stated and all goods offered ex-stock are subject to prior sale. Unless otherwise stated, the Purchaser shall be responsible for charges relating to packing, insurance, delivery costs and all taxes (including Goods and Services Tax) and duties. The terms of payment for account customers are net cash thirty (20) days (that is twenty days from the end of the month in which delivery is made) unless otherwise stated / provided on the front of this document or agreed to in writing by HVAC TOOLS. (b) Where any specification for the goods is to be supplied by the Purchaser, they shall be supplied in reasonable time to enable HVAC TOOLS to complete delivery by the date for delivery. The date for delivery is the estimated date for delivery only and HVAC TOOLS will be under no liability for any loss or damage if the goods are not delivered by that date. Where HVAC TOOLS is unable to deliver the goods due to accidents to machinery, industrial disputation, strikes, lockouts, breakdowns, labour shortages, fires, floods, delays in transportation, lack of transportation facilities, restrictions imposed by any laws or any cause beyond the control of HVAC TOOLS then the date for delivery will be extended by the duration of the delay. HVAC TOOLS reserves the right to deliver the goods in whole or by instalments, as well as to deliver prior to the date for delivery and in such event the Purchaser shall not refuse to take delivery of the goods. Where the goods are delivered by instalments, each instalment shall be deemed to be sold under a separate contract. Any failure on the part of HVAC TOOLS to deliver an instalment within a specified time will not entitle the Purchaser to repudiate the contract with regard to the balance remaining undelivered. (b) Account fully to HVAC TOOLS for the proceeds of sale. (2) If the Purchaser duly calls upon HVAC TOOLS to indemnify it pursuant to a right accruing to the Purchaser under the Consumer Guarantees Act 1993 in respect of any liability of the Purchaser to a Consumer as a result of a breach on condition or warranty complied by the Consumer Guarantees Act 1993 in a contract for the supply of goods by the Purchaser to that Consumer, sub-paragraph (1) will not apply and in respect of goods that are consumer goods HVAC TOOLS’s liability is limited to indemnifying the Purchaser in accordance with the Consumer Guarantees Act 1993. In respect of goods that are not consumer goods, HVAC TOOLS’s liability is subject to the Consumer Guarantees Act 1993, liability to pay to the Purchaser an amount equal to the cost of replacing the goods, or the cost of obtaining equivalent goods, or the cost of having the goods repaired – whichever is the lowest amount. (c) Sale to consumers: In the case of goods supplied by HVAC TOOLS to a Purchaser who is a Consumer, to the extent that the goods are not consumer goods, the liability of HVAC TOOLS to that Purchaser for breach of any warrant or condition (other than a warranty or condition implied by the Consumer Guarantees Act 1993) or for breach of any duty of care shall in all cases be limited, at the option of HVAC TOOLS to any one or more of the replacement of the goods, or the supply of equivalent goods, or the payment of the cost of having the goods repaired, and (without limiting this) shall not include any liability in respect of or arising from or in connection with any special consequential direct or indirect loss, damage, harm or injury suffered or incurred as a result of such breach. To the extent permitted by law, and excluding vacuum tubes, lamps, test leads, batteries, glass components, items of electrical control including electric motors, have warranties for ninety days from the date of delivery unless otherwise stated or in accordance with other suppliers conditions to HVAC TOOLS. All other items shall have a warranty of twelve months from date of delivery unless otherwise stated. Product failure due to corrosion, foreign matter entering the pump, condensation/water interference, unauthorised modification, abuse and normal wear and tear is not covered under the terms of this warranty. 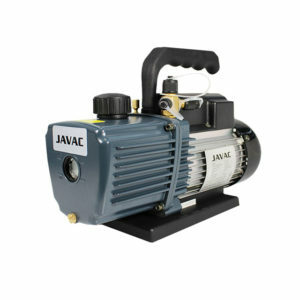 The Purchaser is obliged to protect the pump and/or equipment from the application. The warranty is applicable subject to no alteration to serial numbers, identification plates nor any interference or modification with working mechanisms. Goods used for rental shall have a total warranty of three months and it is the Purchaser’s responsibility to advise HVAC TOOLS that the goods will be used for rental. All items imported or purchased for resale by HVAC TOOLS are subject to the warranty of such manufacturer or supplier and limited to such warranties. Terms or warranty are subject to proper usage and compliance with operating procedures. Warranty claims must be made within the warranty period. (d) Where the size or quantity of the order is changed, the price to be paid by the Purchaser for the goods will be recalculated either in accordance with HVAC TOOLS scale, or prices applicable to the revised quantity, or at the rate at which the price of the order being charged was originally calculated – whichever is the greater. Any samples exhibited to or inspected by the Purchaser are solely for the Purchaser’s convenience and do not constitute a sale by sample. All samples produced for the examination of the Purchaser remain the property of HVAC TOOLS. Samples shall be returned to HVAC TOOLS on request. The failure by HVAC TOOLS to enforce any of the Conditions or to take action in respect of any breach shall not be a waiver of any of these Conditions even if such failure or breach is continuing or is repeated from time to time and no case may be pleaded against HVAC TOOLS, either at law or in equity in any circumstances whatsoever. These Conditions shall be governed by and construed in accordance with the law of New Zealand. The Purchaser and or representative acknowledges these Terms and Conditions and agrees to abide by them. Acceptance is considered automatic when a commercial purchase order is raised.